1. What is sterling silver ring? 3. Why sterling silver rings? 4. Fake sterling silver rings? 5. How to care for sterling silver rings? 6. Can sterling silver rings be resized? WHAT IS STERLING SILVER RING? Silver is an element that naturally exists in the earth. Silver is mined from about 60 countries around the world, with Mexico leading, followed by Peru, China, Australia and Russia. Silver is extracted from the veins (the natural veins of metal ores on the earth) and is a valuable, naturally occurring mineral called a sand deposit. Silver is usually mined as a by-product of copper, gold, zinc or lead and is one of the most readily available metals. However, the material has natural plasticity. It may inadvertently bend or bend its original shape, so silver is easily damaged in a pure state. Alloys such as copper are typically added to make silver available for jewelry. For centuries, sterling silver has been a precious material for making jewelry and other items because of its high gloss and versatility. Sterling silver is the standard for beautiful high quality silver jewelry. There are many kinds of silver on the market, which can be easily confused when you hear these terms, such as pure silver, sterling silver, 925 sterling silver, etc. Pure silver, also known as fine silver, is relatively soft, very malleable and easily damaged. The actual silver content is 99.9%. Due to its high purity, fine silver is too soft to be used in jewelry making, so it is often used in combination with other metals to produce a more durable product. Sterling silver is an alloy produced when pure copper is added to pure silver to make the resulting compound more durable and less flexible. Typically, sterling silver has a purity of 92.5%, which means that 7.5% of the alloy is made of copper or other metals (usually nickel or zinc). The primary purpose of introducing a small amount of copper into the silver product is to impart some additional strength and durability to the silver. Sterling silver is the main material used for silver jewelry, gifts, hollows and cutlery. A common question is what is the difference between sterling silver and 925 sterling silver. The short answer is, no. 925 sterling silver and sterling silver are different names for the same silver alloy. They are terms that are often used interchangeably. The sterling silver made in the US is labeled 925, .925 or 92.5. According to US standards, jewelry of lower purity is not considered sterling silver. But other countries may have their own sterling silver rating. For example, the French sterling silver standard requires a purity of 95%, higher than other countries. Be sure to check the purity of the silver before purchasing. All silver rings in findurings.com are made of 925 sterling silver. The number 925 is printed on silver, usually in the hidden part of the jewelry. This number is called a mark and represents the percentage of silver purity in the alloy. In other words, 925 is the same as sterling silver, which means that if there are any other stamps on the metal, it is not sterling silver. Alternatively, the logos STER, STG, SS and Sterling Silver can be stamped with 925 instead. Sterling silver can be used in a variety of imaginable jewels, such as rings, to create a stylish look. Modern jewel designers flock to this precious metal because it is the perfect combination of ductility, aesthetics and durability. Findurings lists the reasons why you can't resist sterling silver rings. Silver jewelry is very durable if taken care of properly. Rings made of silver can be repaired quickly, so making silver very economical because you don't need to buy another ring in case you break yours. Sterling silver is one of the metals that will last a lifetime after proper treatment. When you are not using it, you can easily maintain your silver jewelry when you store it carefully in a sealed bag or other container. Because silver is a relatively soft metal, it is easy for jewelers to mold and test. This means that there are constantly new designs to choose from. Any woman who likes to keep up with the latest news on fashion and jewel knows that the pace of fast fashion jewel is dazzling. The popularity of sterling silver means that it is almost always guaranteed to enter. Even if the design changes, the latest jewelry styles will always include sterling silver. Jewelry made of silver has a variety of designs. More jewel artists can now make more silver designs as compared to those they make from gold and platinum. 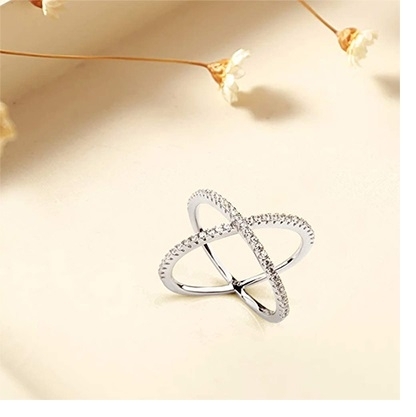 Most jewelry wearers are always looking for something unique, and silver jewelry will provide this precisely. Over time, the wearing of jewelry is changing, and sterling silver will help artists create the latest trends, so they can provide customers with what they want. No matter what the occasion, sterling silver jewelry is suitable. Silver adds an elegant touch to any look. Its versatility can even extend to the appearance of other metals. According to the design, sterling silver is also easy to dress or dress up, adding to the benefits of versatility. 925 sterling silver is almost hypoallergenic. People who are allergic to metals such as nickel and brass can wear sterling silver jewelry effortlessly. Unlike cheap nickel, brass or other base metals, it irritates the skin. Sterling silver jewelry contains no metal additives and can cause allergic reactions. Gold and platinum jewelry is known to be very expensive compared to silver jewelry. Most jewelry wearers recognize that for most people, pure jewelry is very affordable and they are white compared to other metals. Silver is relatively cheap because it is often mined, so it is readily available on the market. This makes the jewelry wearer happy because they can get a discount at a relatively low price. How to identify fake silver ring? Here are some indications that your jewelry is made of something other than 925 sterling silver. It attracts magnets. It is very cheap. If you wipe with a cloth, the black mark will not appear. When exposed to nitric acid, cream appears instead of green. HOW TO CARE FOR STERLING SILVER RINGS? The beauty of sterling silver jewelry and gifts is the timeless charm of this metal. Taking care of your silver collection correctly is a sure way to keep your pounds at their best. With proper care, your premium silver will last a lifetime. Store the silver in a cool, dry place. Like other precious metals, pure silver can oxidize over time. To reduce scratches and other damage, store your silver jewelry in a separate compartment in a bag or jewelry box. If you throw jewelry into the dresser drawer and rub it against each other, scratches will occur. Do not use sterling silver in chlorinated water or when using household cleaners such as bleach or ammonia, as these chemicals can damage silver. The best way to prevent smudging is to actually wear your sterling jewelry or use your silver products regularly. Clean your silver regularly. Care should also be taken to prevent discoloration of the silver, which naturally occurs when silver reacts with sulfur or hydrogen sulfide in the ambient air. While wearing silver jewelry is often the best way to prevent smudging, regular cleaning of all silver products prevents discoloration and maintains a silvery sheen and sparkle. If the pound becomes tarnished, it can be easily restored to its original luster by using a paste, a liquid polish or a treated polishing cloth for silver. Or you can simply wash the jewelry or silverware with warm water, wipe with a small soap or toothpaste, rinse, and then dry with a soft cloth. Avoid using thin paper or paper towels as they will scratch the silver. You can find fine silver polishes, solutions or cloths that are suitable for removing stains in most hardware stores or specialty stores. When it becomes visible for the first time, it is the easiest to remove discoloration. CAN STERLING SILVER RIGNS BE RESIZED? The good news is that the right jeweler with the right amount of experience and expertise can actually resize the sterling silver rings for you. If you have a sterling silver ring that needs to be resized, get a good jeweler to do it for you. However, you have to be very careful when resizing these rings. Don’t worry, Find U Rings offers free size exchange for all rings.